Job Placement Services - Jobs Plus, Inc. If you are looking to hire an employee, a Jobs Plus Employment Specialist will work with you to identify your job needs. Jobs Plus can provide skilled individuals to meet your expectations. Jobs Plus will also provide you with the support to assure successful placement, including job coaching and follow-up. 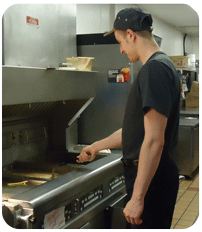 Many of our workers have experience in various areas including the Manufacturing Industry with product assembly and packaging; Clerical Services such as document shredding, bulk mailing, collating, copying and phone answering; Maintenance including cleaning services and grounds keeping; and Food Services including food preparation, busing tables and dishwashing. For high production demands or ongoing intensive jobs, Jobs Plus can provide you with an on-site team of workers with a trained supervisor. Jobs Plus contracts with you to get the work done, which saves you time. Jobs Plus will contract to do work in our production facility as well. Benefits of utilizing our production sites include saved space at your facility and increased manpower. Job Plus can store some of the inventory needed to do the projects and we have 75 plus motivated individuals ready to do the job. See how your organization can take advantage of the Employer Benefits of our services.